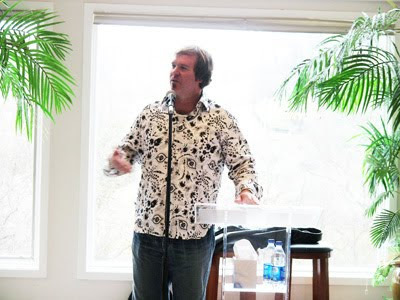 Singer and songwriter, Terry Warren, was invited to our Nashville home yesterday to sing and share with our girls. Originally from Titusville, Florida, Terry played football and was an All-American linebacker for Florida State University. Upon graduation, he was drafted by the Dallas Cowboys. After a severe back injury his rookie year that ended his sports career, Terry pursued his musical talent and appeared and performed on several TV shows and movie spots, eventually landing the role as Jean Val Jean in Les Miserables on Broadway! Terry shared his own personal experiences and sang several songs for our Nashville residents and staff. Throughout the performance, he shared his powerful testimony as a way to encourage the girls to seek God for healing from any negative thoughts or low self-worth. Due to personal tragedy in Terry’s life, he had to walk away from his music for the last 6 years, but he shared how God has miraculously brought healing to several relationships and is making a way for him to share Christ through his music. Terry’s down-to-earth message of hope and healing challenged the residents to never give up and always choose forgiveness. To learn more about Terry Warren and his music visit www.myspace.com/terrywarrencom. Click here to view a short video clip of his time at Mercy Ministries.